Decorating for Easter doesn't need to be expensive - there's no need for shop-bought decorations when you can make unique, exciting creations at home. While your kids are having all the fun, you can track exactly how much money you've spent on supplies and how much you're saving by doing it yourself using our free Money Dashboard budgeting software. 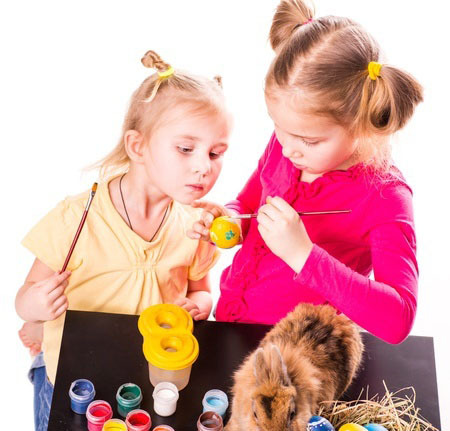 These five examples are super easy, giving your kids a fun-filled afternoon of creativity, without breaking the bank. What's more, none of these ideas should cost any more than a couple of pounds to put together. Painted eggs are ideal for Easter, and these will add some serious sparkle to your decor. Start by hard-boiling then cooling a few eggs. Once they're ready to go, paint them in pretty pastel colours. Pale pink, baby blue, and buttercup yellow are all good choices for spring. Once they've dried, use a glue tube to paint dots onto the surface of the egg and then sprinkle with glitter. Once they've dried, put them on display in a glass bowl. Flowers are an Easter favourite, and you don't need to spend a lot of money on fancy vases to make them look good. If you're wondering how to save money, it couldn't be easier. Take some old jars and soup cans, give them a thorough wash, and then cover them in spring-time wrapping paper. Look for paper with a floral motif, or in the same pastel shades as you used for the glittery eggs. Pop a big bunch of daffodils or tulips in, and you have a smashing centrepiece. The most enjoyable part of Easter is eating our body weight in chocolate. Papier mache birds nests make great display bowls for egg shaped chocolate treats. Take a small bowl, turn it upside down, and cover with cling film. Next, take some shredded newspaper and dip it into a mixture of water and PVA glue. Cover the bowl with it, and then take some dry paper strips and layer them on top: this will give the finished bowl a messy bird nest look. Leave it to dry overnight, paint it brown, and fill with treats of your choice. Budgeting is easier if you're feeling creative, and this candle-holder can be made with simple household items. Put an upside down glass tumbler at every place setting, using the bowl of the glass to display a painted egg and some colourful sweets. Perch a tea-light on the base of the glass, and voila: instant Easter candle display. The best thing is you can eat the sweets at the end, as they won't be contaminated by the candle wax. Not the red and green blinking ones, but if you have any white fairy lights, they can definitely add a bit of flair to your Easter decor. Lay them along the mantelpiece, or drape them over a mirror. Cut some butterflies out of purple, blue, and pink craft paper and stick them around the lights for added Easter flair.